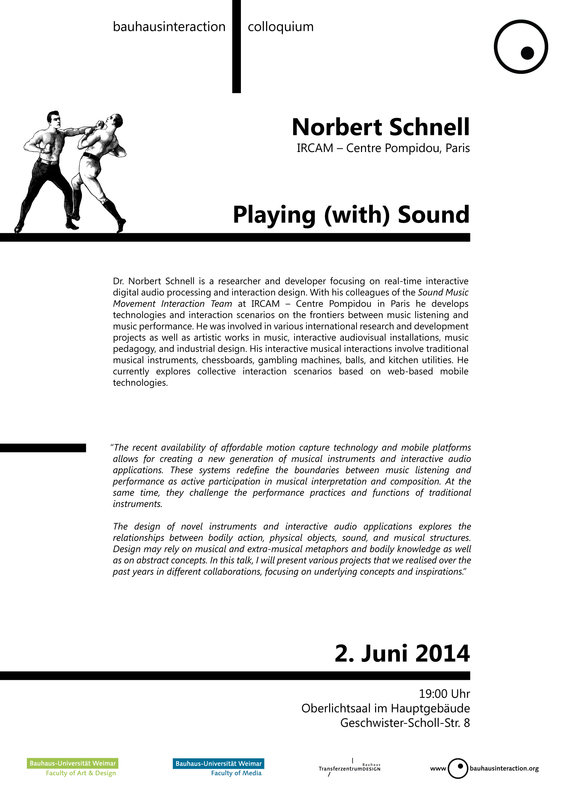 Dr. Norbert Schnell is a researcher and developer focusing on real-time interactive digital audio processing and interaction design. Together with his colleagues of the Sound Music Movement Interaction Team at IRCAM – Centre Pompidou in Paris he develops technologies and interaction scenarios on the frontiers between music listening and music performance. He was involved in numerous international research and development projects as well as artistic works in the field of music, interactive audiovisual installations, music pedagogy, and industrial design. In 2007 he held the DAAD Edgard Varèse Guest Professorship for Electronic Music at the Technische Universität Berlin. Having created musical interactions that – apart from digital technologies – involve traditional musical instruments, chessboards, gambling machines, balls, and kitchen utilities he currently explores collective interaction scenarios based on web-based mobile technologies that involve many people engaging in making music together.